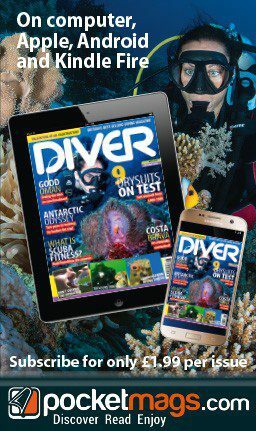 ● DIVER is Britains no.1 diving magazine, outselling all its competitors put together, at bookstalls and by direct subscription. It covers every aspect of the sport, especially in the realms of gear testing and surveys, diving holiday destinations, and advances in technology and techniques. The magazine has an international following and reputation for integrity – “the magazine that’s straight down the line” is its slogan. Twice a year the diving world gears up for two highlights of the sport’s calendar – the London International Dive Show (LIDS) at ExCeL, and the Birmingham Dive Show (DIVE) at the NEC. Organised for more than 25 years by DIVER, Britain’s best-selling diving magazine, each event attracts hundreds of exhibitors offering the latest diving holidays, training courses, and dive gear – on display and to buy – and is visited by thousands of experienced and aspiring divers from the UK, Europe and beyond. The Dive Shows also deliver an unrivalled programme of free presentations from the world’s top diving speakers. And this is combined with popular in-hall features such as the Try Dive Pool, Rebreather Pool, PhotoZone, and New Product Showcase, plus themed Travel and Dive-Training areas. ● Divernet.com – the DIVER Magazine website, was launched in 1996 and quickly gained an outstanding international reputation. It offers access to many years of DIVER’s editorial archives, with feature material updated monthly as soon as the next issue goes on sale. The latest diving news is updated regularly and a topical email newsletter, Divernet Xtra, completes this highly successful site. ● Underwater World Publications (UWP) is a company within the DIVER Group which publishes and distributes a wide range of books for divers. Best-selling UWP titles include the renowned DIVER Guides to different areas of the British coastline. The full range can be viewed and ordered on-line at Divernet.com. ● Underwater Contractor International is the essential publication for the commercial diving industry. It covers all aspects of the business, including offshore, inshore and inland diving works; ROVs, AUVs and cable-laying; safety and training; oceanography; and military diving. ● International Ocean Systems is the magazine for ocean professionals covering navigation and positioning, ships and salvage, ROVs/AUVs/USVs, ocean instrumentation, survey, mapping and sonar, cable/connectors and winches, research and development, diving and associated services, government and others allied to the field.